Fed up with the slow charging of mobile phones through portables and that too leading the pollution to escalate? Here’s a solution. Mankind already knows the real picture of fossil fuels at present which is getting depleted at an exceptional rate. As the dependence on fossil fuels has been rising at such a tremendous rate, the debate over other mechanisms for the use of renewable energy has intensified. Keeping this in mind we caught our eyes on a startup named ‘Flash’. Flash showcases a High power density energy storage device with quick operating time and long cycle life. Krishna Suresh Pawar, a Fourth-year undergraduate student currently pursuing Mechanical engineering at Sinhgad Institute of Technology, Pune got his interest inclined towards Engineering when he used to draw Futuristic vehicles on the back pages of his academic books in the school. This turned out to be more interesting for him when he tried converting these drawings on paint but unfortunately failed due to improper sync between his imagination and technicalities of the software. In the third year of engineering itself, a true spirit of working on Green Energy got generated in him when he realized this one disturbing fact regarding the lack of technological advancement in India. He started conducting research on Super-capacitors. He realized the shocking Technological advantages of Super-capacitors as compared to batteries. Although batteries are termed as high energy supplying devices, the main disadvantage of batteries is that their structure’s architecture gets disturbed with time causing the life span to decrease. The existing Li-on batteries contain the problem of low power density. Low charging- discharging rate takes a lot of time of the users. Along with less cyclic life, the disadvantage is the level toxicity batteries contain. On the other hand, EC’s comes in the spotlight due to its fast charge/discharge capabilities and superior cycle life. Considering these facts, this device can be implemented in numerous applications where a situation occurs where you need sudden power supply without any undesirable problems occurring. 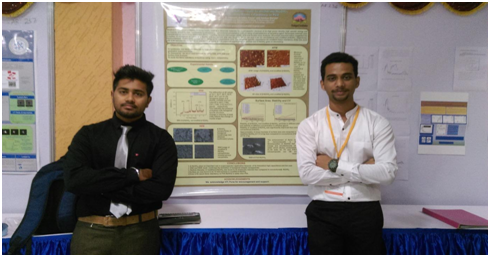 Keeping one thing in his mind that the biggest Entrepreneurs in the world are Engineers, Krishna along with his roommate started working on how to commercialize the product on the parallel track of his Research work. He was assured of the fact that business model is of much more importance and you only gain the planned outcomes with a well-planned strategy. Flash is in its initial startup phase and the future work consists of validation and evaluating the valuation, both work been conducted on parallel tracks, thereby covering vast topics within a short period of time. 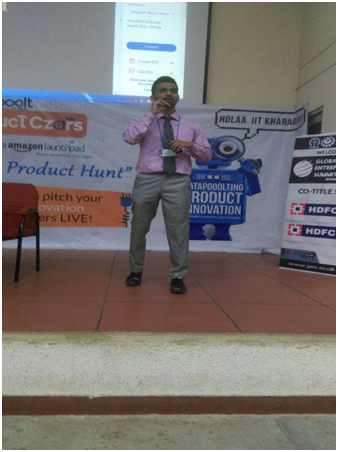 Product pitch at Catapooolt event. This product has got selected in an ongoing Crowdfunding event organized by Catapooolt where the top 15 startups will make it up to the investor’s table. The campaign describes the overall product, how different it is from other products, the timeline and finally the strength of the product. The campaign has attracted an investor and is willing to invest only if they achieve 50K before the campaign ends. Research & development in simple words means developing the work in a substantial manner for the benefit of society. This concept is far more degraded in India and especially in the field of Energy. The roof-breaking demand for Green energy conversion and conservation led the founders to think of commercializing their work in the market. It would not only help contribute towards India’s economy but also providing a satisfying comfort to the rural regions. Considering the highly elevated demand for Green energy, Flash resembles a highly promising technology and will become a highlight in the future. They need your support in initializing the process of commercializing the project since it is majorly dependent upon the R&D. The amount will help them to motivate and work further towards building a promising product for the benefit of society. They want to fasten up the pace and proceed towards another product/program which would be an advanced version of the existing work. Be a boost for them to starting a new segment of products in the market and be a part of the change. You can contribute them at https://www.catapooolt.com/flash .